Priced per package of 50. Substantially increases the power of your vacuum casting machine by increasing the exposed surface area of the investment 2 to 3 times more than perforated flasks. Vacuum channels formed by Tivac Paper Flask Liners are extra-wide, creating an unobstructed air flow unlike the smaller zigzag channels formed by mesh materials. Provides over 40% more vacuum capacity than wax web, plastic web, or vacuum rods. 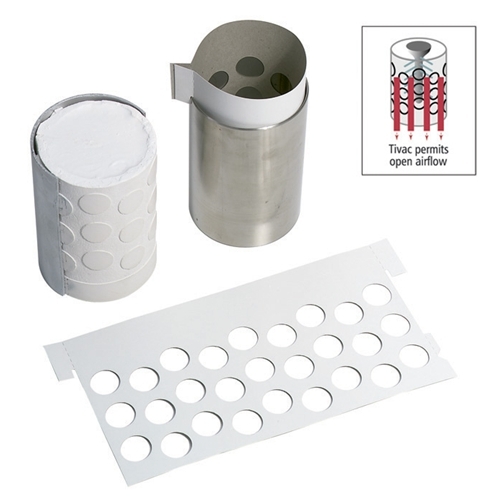 Eliminates need for perforated flasks. Burns out cleanly. Completely nonhazardous. Built-in collar replaces flask sleeves to speed up investing. Tivac #5 fits 5" x 6", 5" x 7" and 5" x 8" solid-wall flasks.